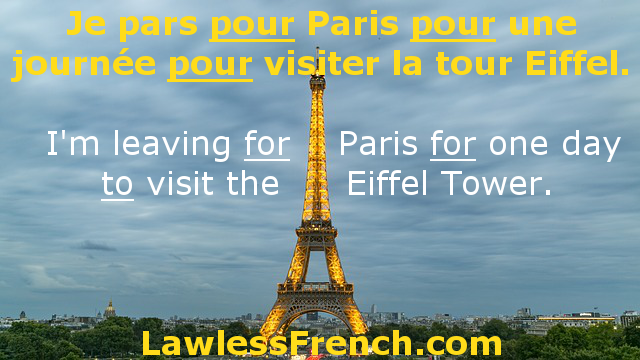 The preposition pour usually means "for" and may be followed by a noun, pronoun, or infinitive. C’est pour toi. It’s for you. Je l’ai acheté pour Pierre. I bought it for Pierre. J’ai appelé pour te poser une question. I called to ask you a question. Il va être viré pour le vol. He’s going to be fired for theft. Elle est pour l’amendement. She’s in favor of the amendment. Pour moi, c’est une bonne idée. I think it’s a good idea. Pour elle, c’est trop difficile. She thinks it’s too difficult. Pour le solde, on peut le payer demain ? As for the balance, can we pay it tomorrow? Je téléphone pour votre voiture sur Le Bon Coin. I’m calling in regard to your car on Le Bon Coin. On part pour Nice. We’re leaving for Nice. Il a pris le bus pour le bureau. He took the bus to the office. Je l’ai eu pour 10 euros. I got it for 10 euros. Pouvez-vous parler pour lui ? Can you speak on his behalf? On sera à Paris pour trois jours. We’ll be in Paris for three days. Je vais voyager pour un mois. I’m going to travel for a month. Some verbs must be followed by pour in front of a noun or infinitive. Pour is often followed directly by a noun, with no article in between. Learn more: Prepositions with nouns. Does pour que need the subjunctive? Does pour peu que need the subjunctive?